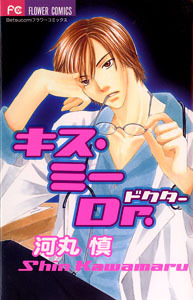 Well, if teacher-student manga gets boring for you, how about some doctor- student manga? Actually, this one is doctor- student, producer- student, teacher- student, and student- student. ^_^ I don’t think I have summarized anything by this author before. This is a fun little one-shot volume I picked up because of the cover (yup, as usual, lured in by the pretty boy). This book contains 4 short stories, all very cute. The art is nice, and it isn’t too smutty (well, okay, a little bit smutty). This author seems to like the younger-girl/older-guy combination! The first story is about HIJIRI Kaho, a 2nd year high school student who is hopelessly devoted to Tsukishiro-sensei, a doctor at the local hospital. Kaho is pretty transparent in her adoration of the good doctor. See hangs all over him. Tsukishiro-sensei is a cool, stone-faced guy. His personality is very serious. He patiently puts up with Kaho’s antics, but the jealous nurses at the hospital are not as tolerant. Is Kaho just feeling girlish infatuation, or is it true love? And how does the doctor really feel behind his serious mask? The third story is the teacher-student one, and it’s pretty cute. It’s not only a teacher-student story, it’s an Obligatory Valentines Day story ^_^ Our heroine MIYAGAWA Yuki is in love with her teacher, and even manages to give him some Valentine’s day chocolate and confess her love to him. Unfortunately, she is shot down with the usual ‘You’re a student and I’m a teacher’ argument (hard to beat that). Yuki is determined to get sensei to acknowledge her feelings for him before she graduates. Will she succeed? Oh hohoho!